BioShock 2 Dev Calls Console Wars "Silly"
Are you a diehard PS3 fanboy and registered Sony Defense Force member? Are you a member of Microsoft's legion of Xbots? If you are, then BioShock 2 developer 2K Marin thinks you're silly. 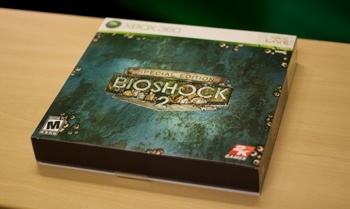 When the original BioShock came out, it was somewhat of a hot spot for fanboys: 360 owners rubbed the acclaimed game in the proverbial faces of everybody who owned the hated PS3, while said PS3 owners took every opportunity they could do pick on the exclusive ... until it actually came out for the console and said haters were forced to agree that it was actually kind of awesome. This not-so-proud tradition was hardly limited to PS3 owners, though - how many 360 fanboys trashed Metal Gear Solid until Rising was announced? PS3 owners might blast Gears of War while Xbox 360 owners hate on Uncharted, but if the games were released on the competing platforms, you can bet that there'd be quite a few minds changed very, very quickly. Speaking with Destructoid, BioShock 2 creative director Jordan Thomas discussed the idea of fanboyism and how it applied to the console wars. "There's a cognitive effect known as 'confirmation bias' which leads people to latch onto conclusions that support their preferences and ignore data which doesn't," said Thomas, "This leads to wild, unreasoning loyalty to a chosen platform, sports team, or brand of soda." "From a development perspective, the console wars are a bit silly; our target is consistency, and it's always kind of sad to see people throwing their energy into 'platform partisanship,' because it seems to flood the critical channels and drown out other creative discourse." So do you hear that, fanboys? Every time you bash the other system for having exclusives that you secretly want, you make 2K Marin sad. And when you make 2K Marin sad, they send Big Daddies after you to punch holes in your chest with giant drills. Fanboy at your own risk.